To demonstrate, she refers to a set of charts she has neatly organized in anticipation of our meeting. She relies particularly on a page titled “Elevating Guest Love,” which features a color-coded pyramid showing elements crucial to maximizing customer loyalty. At its base is Panda’s “Culture/Environment.” The next level is Panda’s “People”—i.e. its employees—who support the “Guest” nearest to the pyramid’s pinnacle. In case anyone is confused about the importance of the guest’s happiness, he appears just below a big green dollar sign. Over the next few months, though, my cynicism will wither. Exploring the empire the Cherngs have built will be like sliding down the quick-serve equivalent of Alice’s rabbit hole to Wonderland. In Panda’s alternate reality corners are never cut, quality is never skimped, and the mutuality between a company and its workers remains as strong as it was during the Eisenhower era. The more I get to know the Cherngs, the more I believe that their emphasis on employee empowerment is more than just talk. To spend time in their restaurants is to see a workforce energized by the promise of upward mobility. “This idea of a purposeful or meaningful life is something that Andrew and Peggy are very dedicated to,” Andrea tells me. It seems likely that their devotion to the recent immigrants who work for them is based on the fact that they were once immigrants themselves. 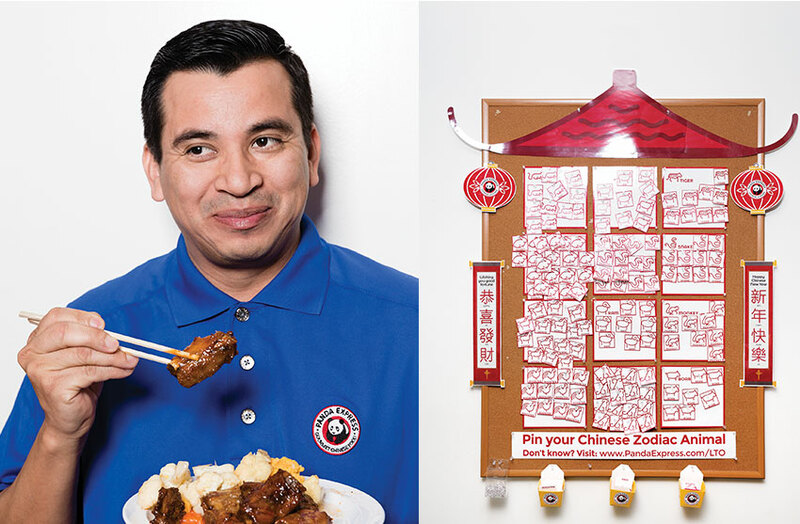 The story of Panda Express begins in a hardscrabble town outside Yangzhou, China. In those days work meant decades of stooping over rice-paddy fields battered by dry winds gusting off the Yang-Tse River. By 1947, when Andrew was born (his given name is Jin Chan Cherng), the country had endured a decade of Japanese occupation and was then being ravaged by civil war between the Communists and the Kuomintang. His parents decided it was time to get out. Andrew’s father, Ming-Tsai, headed for Taiwan, got a job in a restaurant, then sent for his family. But after the Communist takeover, leaving the country became even more difficult. Cherng’s mother hid in the bottom of a boat with other escapees but didn’t bring Andrew for fear that his crying would give them away. Instead she paid a smuggler to get him out. After three attempts, Andrew was reunited with his mother in Hong Kong. The Cherng family eventually immigrated to Yokohama, Japan, where Ming-Tsai secured work as a chef. Andrew was an obedient child who worked hard in school, and he won a scholarship to Baker University in Kansas. It was there that he met Peggy Tsiang. Like Andrew, she was Chinese but had been raised off the mainland, in Burma. A year later she transferred to the University of Missouri to study computer science, working toward her doctorate by developing a pattern-recognition program that digitized X-rays and applied algorithms to diagnose congenital heart disease. Soon Andrew would join Peggy in Missouri, where he earned his master’s in applied mathematics. They married after moving to Los Angeles, where Andrew briefly managed a restaurant in Hollywood owned by his cousin. Having spent his college summers working in New York City as a maître d’, though, he wanted to run his own place. He persuaded his parents to come to L.A. to help him realize that dream. Among Panda Inn’s growing list of loyal customers was Pat Donahue, whose family owned the Glendale Galleria. Andrew was in the process of launching a second Panda Inn, in Glendale, but he was intrigued when Donahue told him that the Galleria would be opening a new food court. Would Andrew consider a quick-serve version of Panda Inn there? In 1983, Andrew made that happen with the first Panda Express. They also need success stories, and Panda Express didn’t lack for those, either. Restaurants in Southern California rely heavily on Latino immigrants, and Panda is no exception. Take Daniel Pelagio. He was born to farming parents in a small village in Guerrero, Mexico. The poverty was stark. There was no electricity or cars, and the closest drinkable water was a quarter mile away. When he turned 18, Pelagio crossed the border illegally and settled in Santa Ana. His cousin Jose was already working at a Panda Express in the Westminster Mall, and Daniel was hired on the spot, despite speaking no English. By the end of his first year at Panda, he was promoted to cook, then assistant manager and general manager. Peggy and Andrew took an interest in his enthusiastic spirit. As Panda continued to expand beyond California, they tapped Pelagio to help train staff in Arizona and Las Vegas. He embraced the Panda credo of constant self-improvement—Toastmasters, the books, the seminars. Today at 42, Pelagio is the regional director for Panda’s northwest-south region, which means he presides over 69 stores in three states, supervising their financials, training, and recruiting as well as directing community outreach and charitable giving through the Panda Cares foundation. He is also pursuing an online bachelor’s degree in business administration.